The Office of Graduate Education and the Office of Faculty Affairs and Leadership Development is recognizing ten outstanding faculty for Excellence in Basic Science Mentoring. Five of the awardees have appointments in Genetics or serve as faculty for either Bioinformatics and Computational Biology (BCB) or Genetics and Molecular Biology (GMB), curricula managed by the department. Congratulations to Kathleen Caron (Genetics, GMB), Henrik Dohlman (BCB), Ben Major (BCB), Jeff Sekelsky (Genetics, GMB) and Brian Strahl (BCB, GMB). 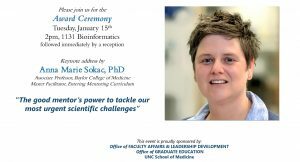 The awards will be presented on Tuesday, January 15th at 2pm in 1131 Bioinformatics.